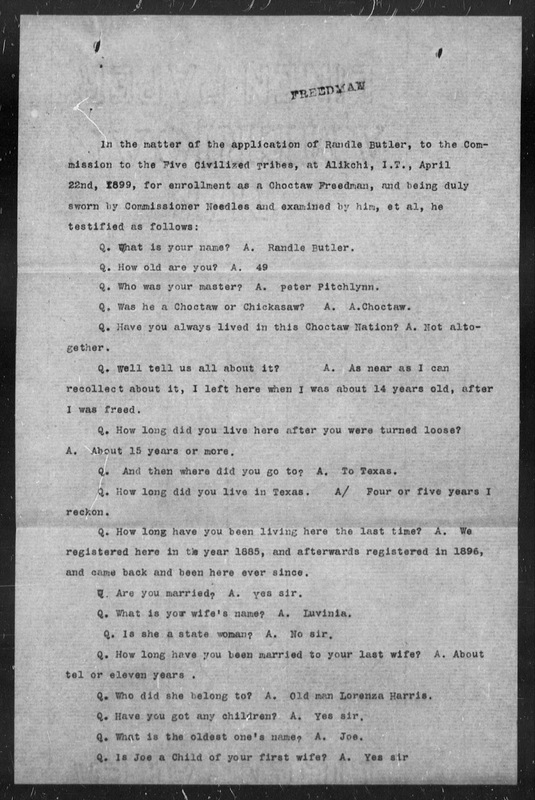 In April 1899 Randall Butler appeared on behalf of his family to enroll his family has Choctaw Freedmen. He resided in the town of Harris, Indian Territory, and lived in Red River County. He represented himself, his wife Louvenia, and his sons Joe, Johnny, Earle, Ollie, and Frances. 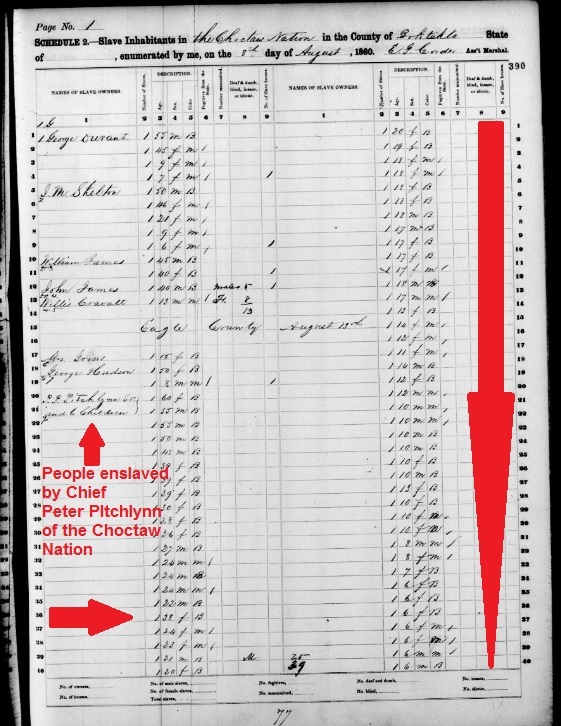 He was 49 years old at the time, and he had been born in the Choctaw Nation, and he and his family were all enslaved by Choctaw Chief Peter Pitchlynn. 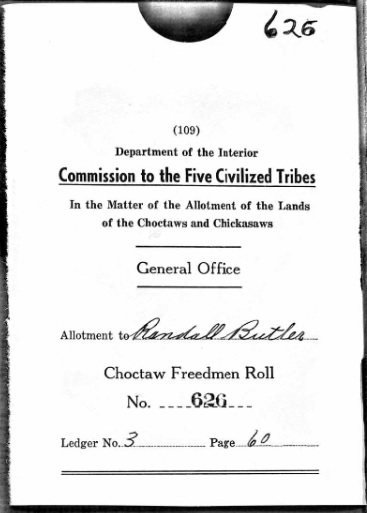 Randall's father was Hannibal Butler and his mother was Mary Butler and they were both enslaved by Choctaw Chief Peter Pitchlynn. Source: Same as above image. 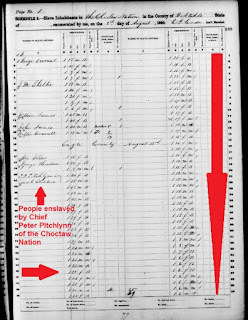 Peter Pitchlynn was a major slaveholder as reflected in the 1860 Slave Schedule from the Federal Census. 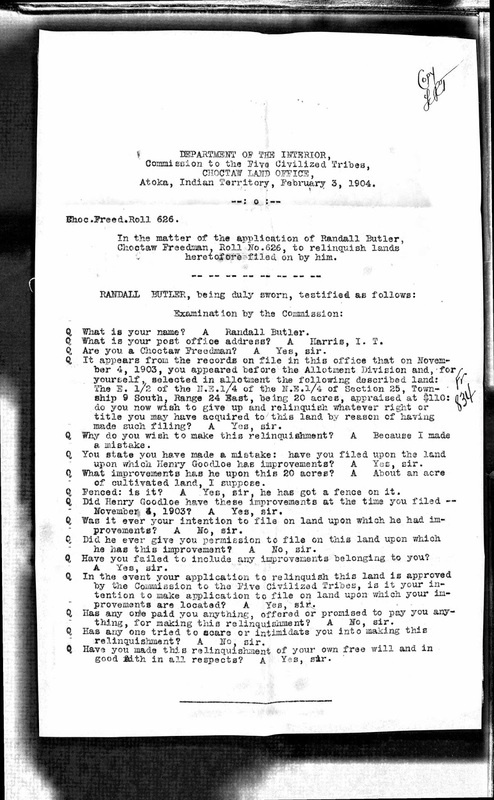 The interview with the Dawes Commission was not especially long but it was still interesting to read. In his interview one can see a certain attitude from Commissioner Needles when he speaks to Mr. Butler. The commissioner asks about his movement after freedom, but he refers to Butler having been "turned loose" meaning after having his freedom. 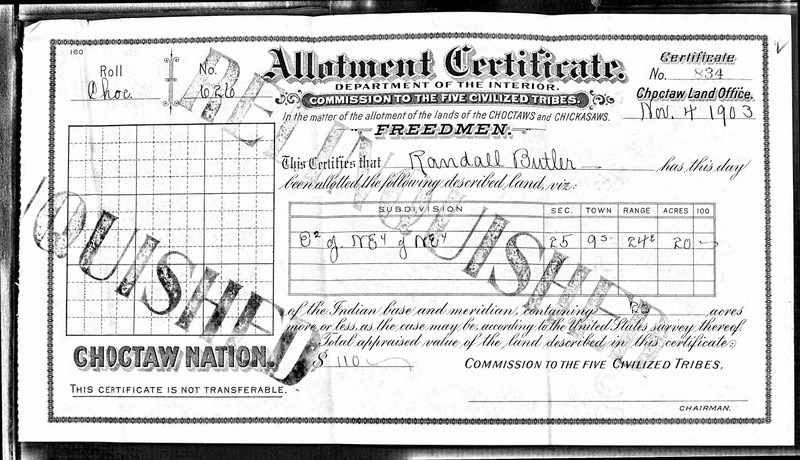 Randall Butler also admitted that he had another child, but when asked if the mother was a "states woman", meaning born in the United States and not in Indian Territory, it was quickly determined that the child would not be eligible for enrollment, due to the status of the mother. Although the application jacket did not have much data, there does seem to be more that can be gleaned from the land allotment applications. 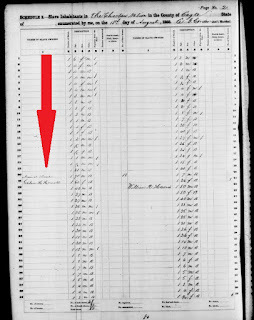 Like many of these files there is data about the land allotment and where the land was to be. 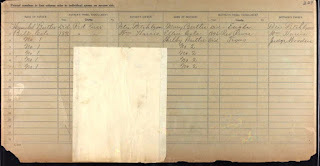 Included in those papers were even some allotment certificates of members of the Butler family. 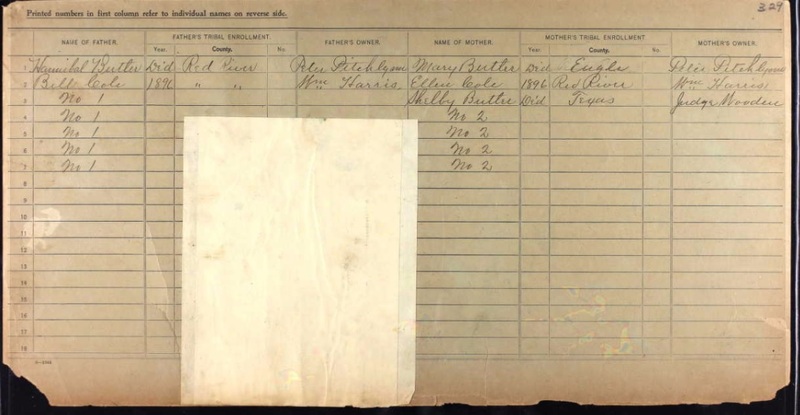 It should be noted that these records are classified by the roll number of the person and not their card number. 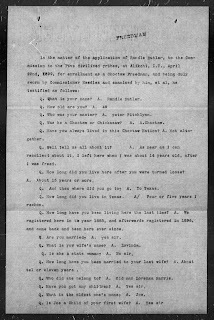 If one looks at the enrollment card (see 1st image) one will find the Butler family on enrollment card number 329. However, the roll number is listed to the left of their name. In Randall Butler's case, his roll number was actual 626. The allotment applications are listed by roll number, and not by card number. 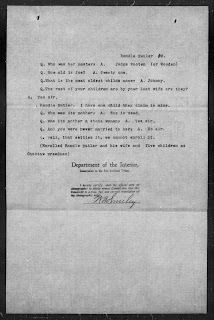 This is because each person who was eventually approved when the rolls closed, received a land allotment--including children. 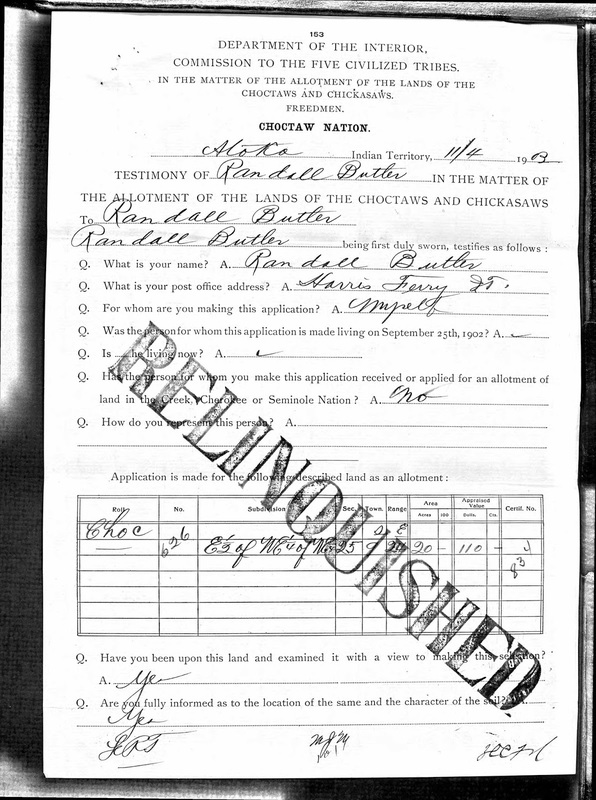 However, what makes the file unusual is that stamped boldly across the allotment certificate are the letters indicating that the land selected was "Relinquished" by Randall Butler himself. 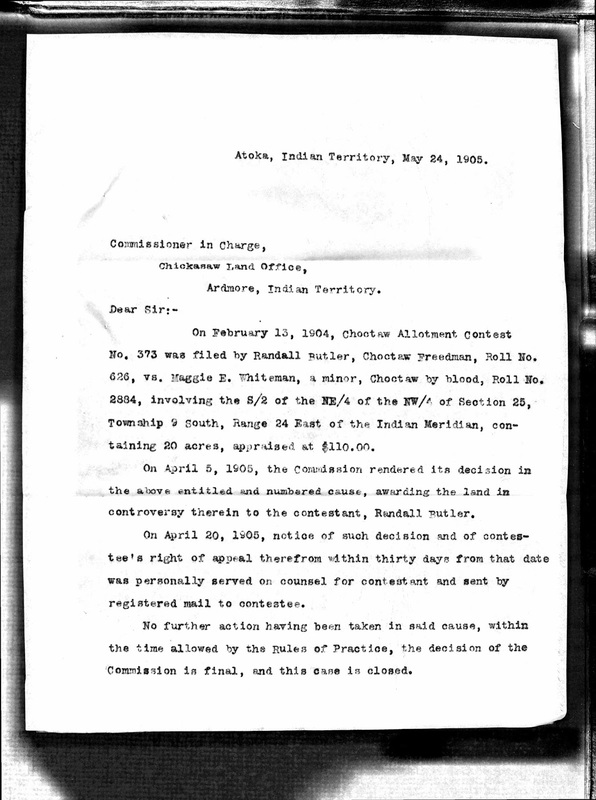 And among the files of all in the household--the land was "relinquished". 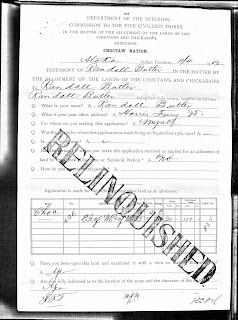 Now looking at the case of Randall Butler and the entire family, it appears that land was allotted to them, acres were selected, but for some reason later relinquished. However an interview was included in the file that explained why the land was relinquished after having been allotted. Apparently some of the lands selected were actually made in error by Butler himself and he later explained how this happened, in the interview. The selection was made in error, because the lands had already belonged to Henry Goodloe who had already begun making improvements upon 20 acres of the land. 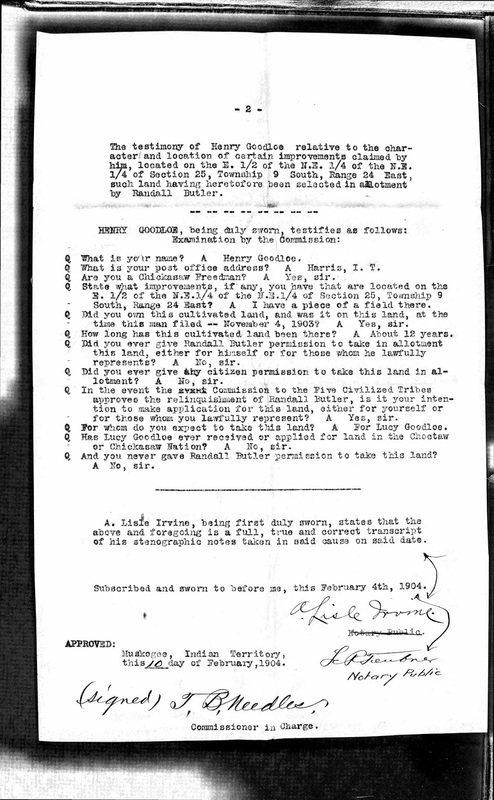 Henry Goodloe himself also testifies and indicates that he and his wife are Chickasaw Freedmen, and that he was planning to select the 20 acres in question for his daughter, Lucy Goodloe. 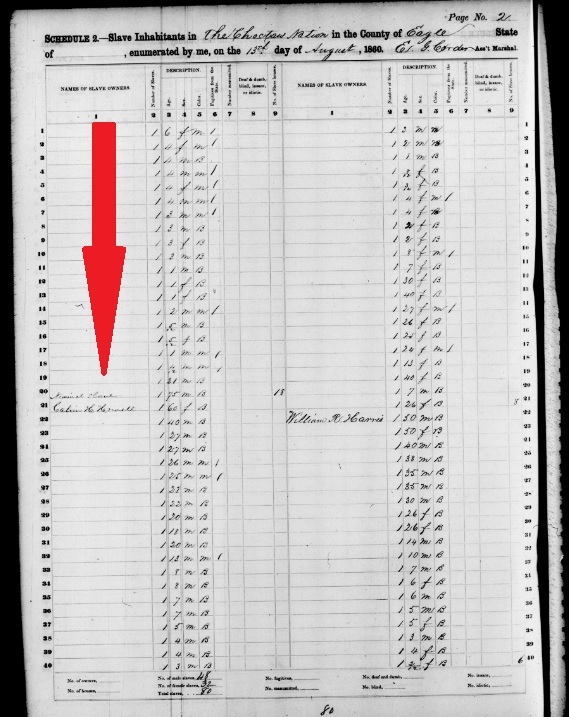 (I also noticed that Henry Goodloe (Goodlow) was a Choctaw Freedman, but during the questioning it was asked if he was a Chickasaw Freedmen, and he replied that he was. 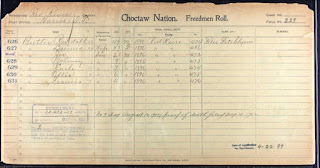 Goodloe was enrolled as Choctaw Freedman, but his enrollment card indicated that he was transferred from a Chickasaw Freedman card. 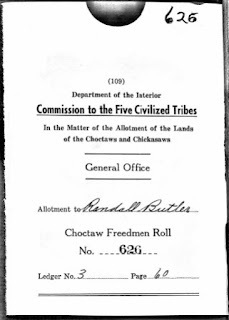 Because these interviews occurred before the rolls were officially closed and all decisions made, Goodlow did speak truthfully for he was at the time, Chickasaw Freedman. One might assume that all land issues were resolved, however, there was another document in the file that caught my attention. 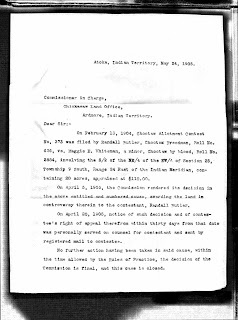 Apparently there was a challenge made for the same land, made by a minor, who was Choctaw by blood. The challenge was made by Maggie Whiteman, a minor contestee. A document in the allotment jacket indicated that a decision was made about the 20 acres in question, and that the land in question was to be awarded to Randall Butler. 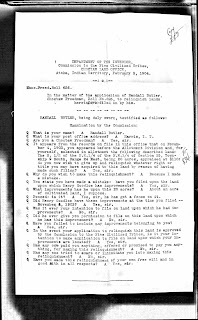 There are many more pages to the allotment file, including one in which Randall sought to combine parcels of land so that they may be adjoining parcels of land. 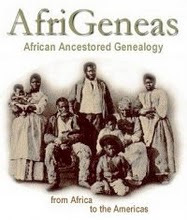 For anyone interested in examining the case further, detailed study of the and records will reflect the years during and after the rolls closed when Freedmen as well as other citizens of the nations began their life anew as land owners. Statehood would eventually come to the territory, and would bring additional challenges as Freedmen along with others struggled to maintain ownership of their land. 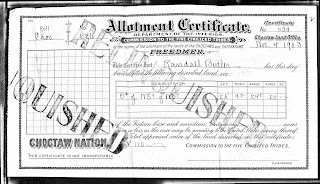 The case of Randall Butler and his family reflects a new era in Indian Territory and one can see from slavery to statehood the steps taken by Freedmen families and others as they settled on their own lands, and moved into a new century, a new state, and a new destiny. 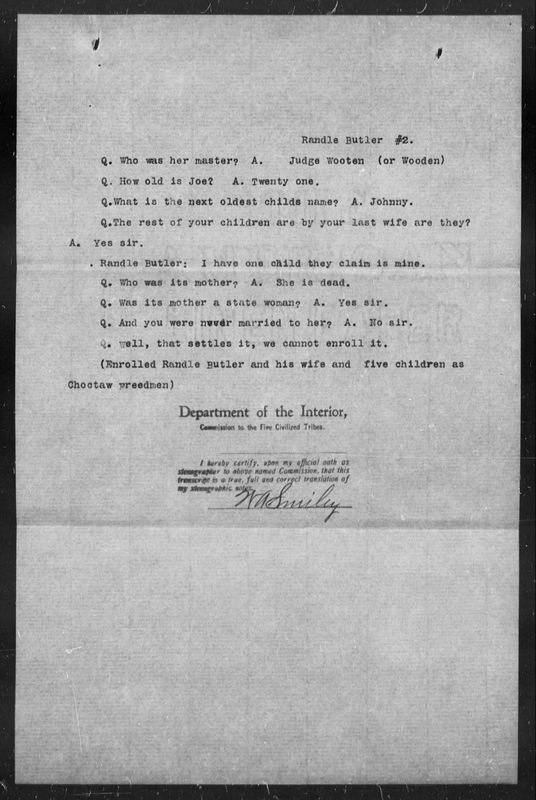 This is the 8th article in a series devoted to sharing families of those held as slaves in Indian Territory. (Now known as Oklahoma.) 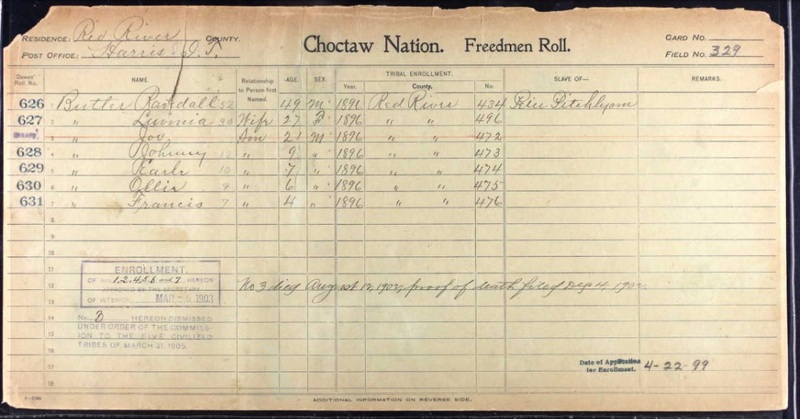 The focus is on Freedmen from the Five Civilized Tribes and are part of the efforts in 2017 to document 52 families in 52 weeks.